With over 15 years of experience ViaCord is a recognized leader in cord blood banking and research. ViaCord is part of PerkinElmer, a global company offering 3 stages of care to help protect your family`s health. With our Down syndrome screening, newborn genetic screening and cord blood banking services, we are committed to protecting the health of your pregnancy, your baby, and your family. www.viacord.com. Monarch HealthCare is a medical group of over 2,000 independent Orange County physicians in private practice, dedicated to practicing medicine the way it was meant to be. Monarch is owned and operated by doctors who believe in the “patients-first” philosophy of health care. Over 175,000 of your neighbors have joined Monarch HealthCare. To find out why, visit our website at www.monarchhealthcare.com. 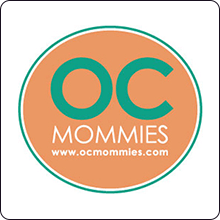 OC Mommies is a social network for moms! Their network is a place to find support, resources, local retail discounts, community events and friendships with other moms in Orange County. Their goal is to create an environment where members feel comfortable sharing their experiences as moms and find everything they need to make the transition to motherhood fun and exciting.